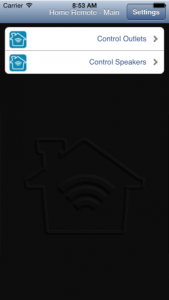 HomeRemote V1.0 – Android and iPhone Apps Launched! 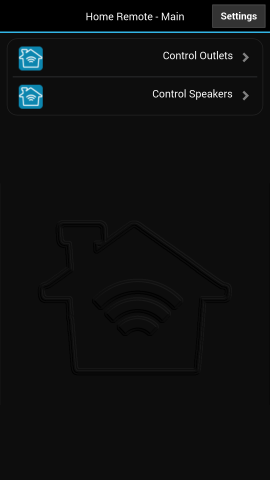 Over the last few months, I’ve gotten several requests to launch an iPhone version of the HomeRemote app which will connect to your existing Arduino server for controlling outlets and speakers. If you implemented this project already, you can just grab the new app(s) for a complete graphical redesign and more powerful settings. Controlling speakers and/or outlets requires an Arduino running the open source 33Snowflakes automation server. Additional features include renaming Zones with a long press on any Zone name, and disabling unused Zones or unused modules from the Settings screen. As before, the server and HomeRemote app code (built on Phonegap) will remain open source under the MIT License here on Bitbucket. Please report any bugs to the Bitbucket page issue tracker. Tagged with: Home Remote, Outlet Selector, Speaker Selector.